Jennifer Park, Molly Sorkin, and André Leon Talley, Oscar de la Renta (Prestel, 2016) Image: Prestel. Oscar de la Renta (1932-2014) was born Óscar Aristides Ortiz de la Renta Fiallo in Santo Domingo, Dominican Republic, the only boy in a family of seven. After moving to Spain to study art at Madrid’s Real Academía de Bellas Artes de San Fernando, in 1954 he began work as a sketcher at Balenciaga; by 1959 he was assisting Antonio del Castillo at Lanvin-Castillo in Paris. 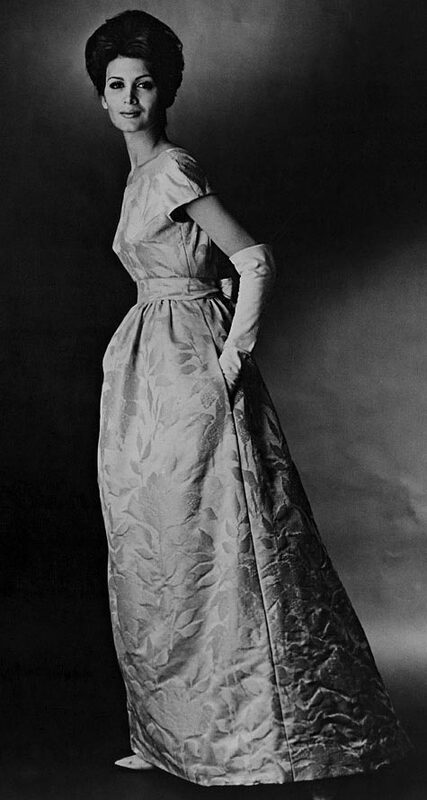 De la Renta fitting debutante Beatrice Cabot Lodge, Life, July 9, 1956. Photo: Nina Leen. Image: Google books. Elizabeth Arden by Oscar de la Renta evening dress in gold and pink silk damask, Fall-Winter 1963. Model: Isabella Albonico. Image: Oscar de la Renta via the de Young Museum. De la Renta licensed his designs with Vogue Patterns from the 1960s to the 2000s. 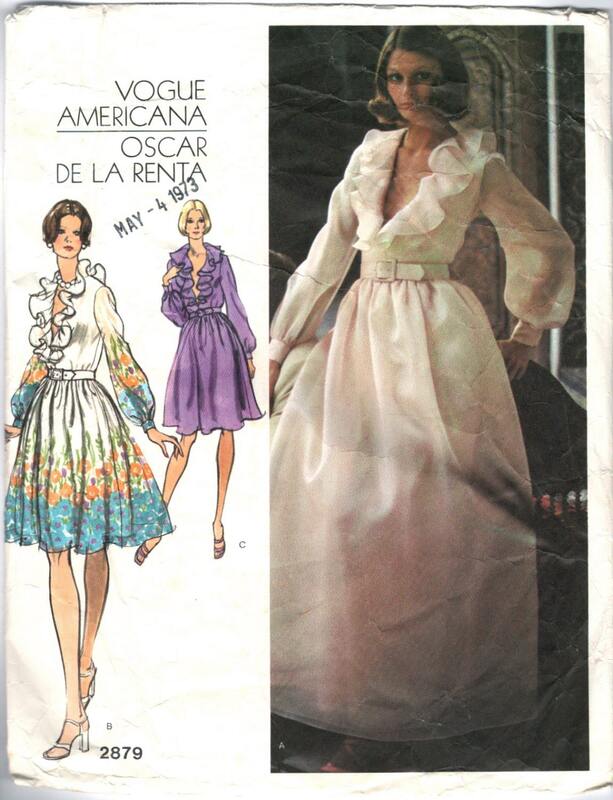 This week, a look at Oscar de la Renta patterns from the ’60s to the ’80s. Oscar de la Renta dress photographed at Villa Boscogrande, Sicily, Vogue, December 1967. Photo: Henry Clarke. Image via Youthquakers. Vogue 1909 by Oscar de la Renta (1968) Image via the Vintage Pattern Wiki. Vogue 2101 by Oscar de la Renta (1969) Image via the Vintage Pattern Wiki. Vogue 2219 by Oscar de la Renta (1969) Image via the Vintage Pattern Wiki. Vogue 2280 by Oscar de la Renta (1970) Image: eBay. 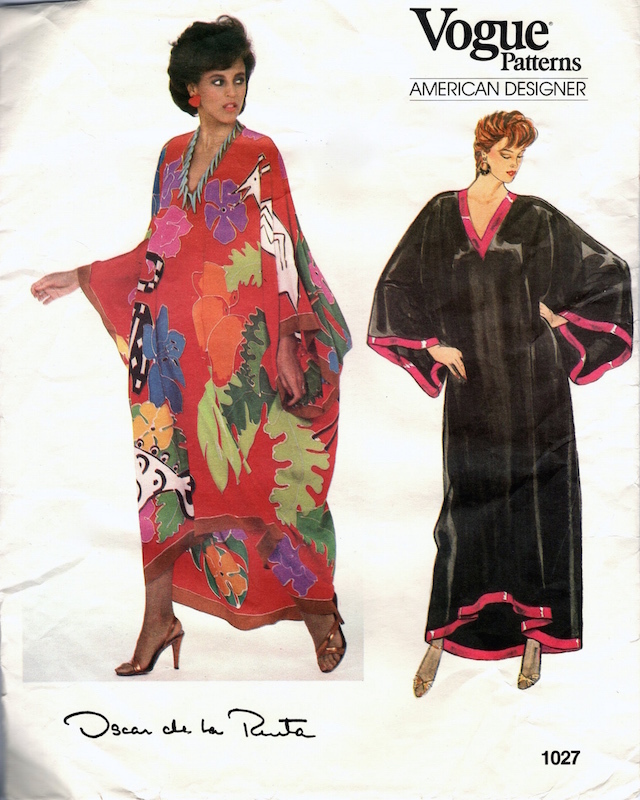 Oscar de la Renta caftan, Vogue, June 1972. Photo: Helmut Newton. Model: Lauren Hutton. Image via Youthquakers. Vogue 2879 by Oscar de la Renta (1973) Image: PatternVault on Etsy. Vogue 1667 by Oscar de la Renta in Vogue Patterns, May/June 1977. Model: Christie Brinkley. Image: Vintage Goodness. 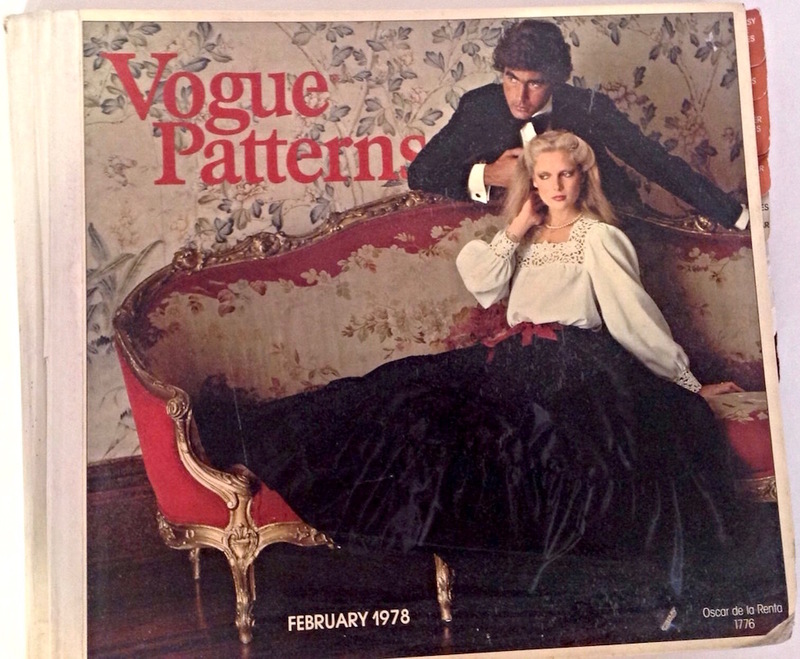 Vogue 1776 by Oscar de la Renta on the cover of Vogue Patterns catalogue, February 1978. Image: eBay. From “Striking Gold,” Vogue, November 1979. Photo: Deborah Turbeville. Vogue 1027 by Oscar de la Renta (ca. 1983) Model: Alva Chinn. 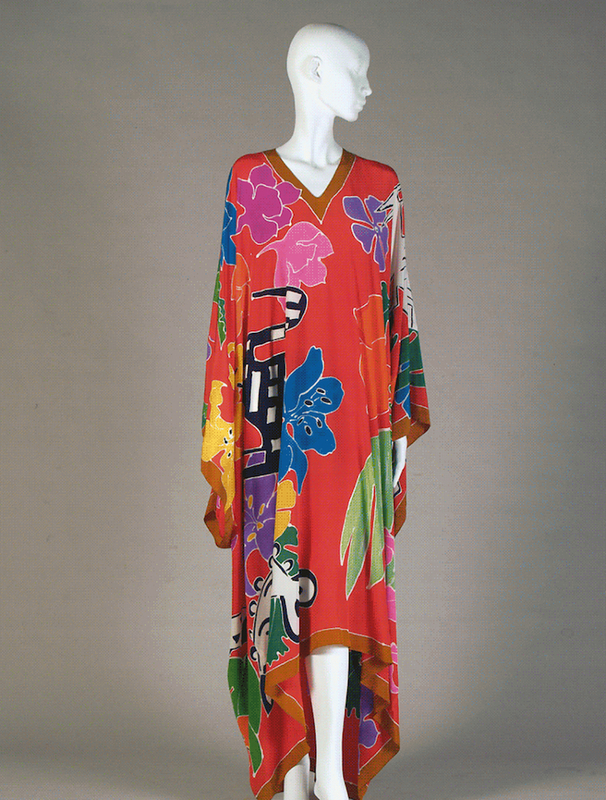 Oscar de la Renta caftan, Spring 1982. Photo: Erin Burns. Image: Kent State University Museum via the de Young Museum. 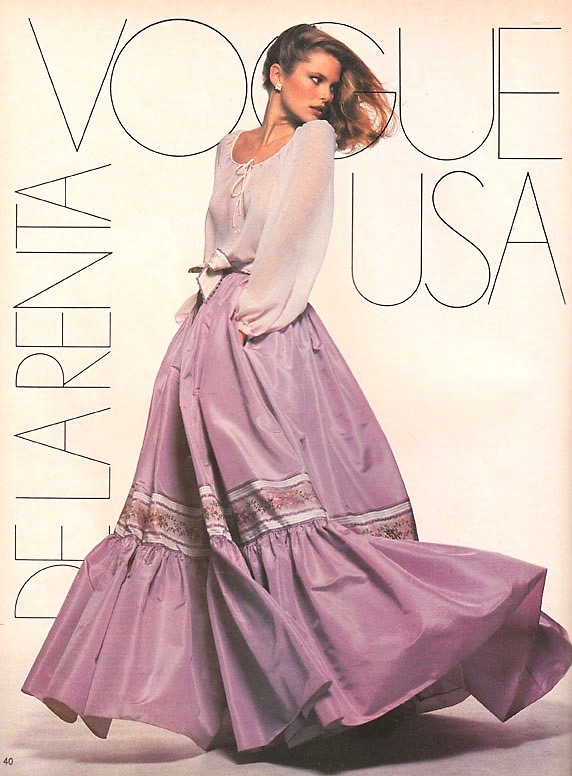 Vogue 1644 by Oscar de la Renta (1985) Image via Etsy. 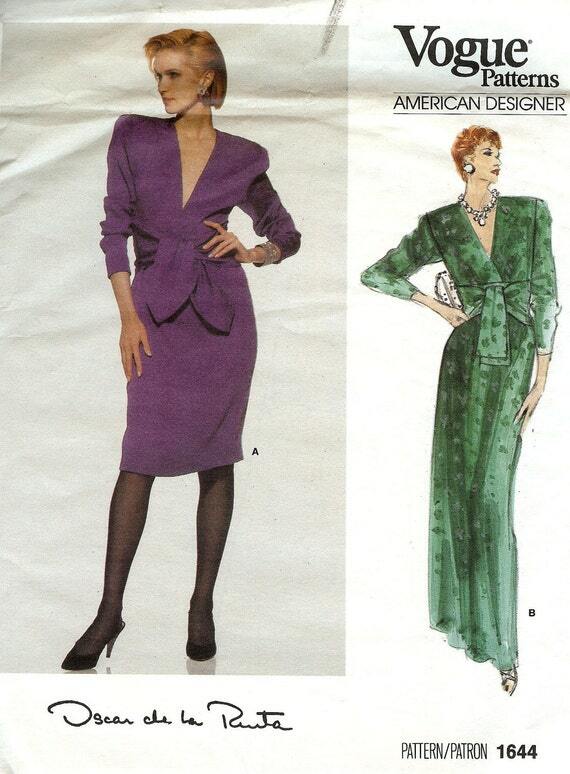 Oscar de la Renta dress, Vogue, May 1986. Photo: Steven Meisel. Model: Michelle Eabry. Image via The Fashion Spot. Cindy Crawford wears Oscar de la Renta on the cover of British Vogue, April 1987. Photo: Patrick Demarchelier. Image: Vogue UK. Vogue 1997 by Oscar de la Renta (1987). Image: Etsy. Don’t Vogue 2185’s ruffles take the cake? Vogue 2185 by Oscar de la Renta (1988) Model: Alexandra Aubin. Image: PatternVault on Etsy. Next: Oscar de la Renta patterns from the 1990s and 2000s. Great post, thank you. It made me realise how broadly he drew influence – his early connection with Balenciaga is clear but also his peers like YSL for the beautiful gypsy-inspired looks and Valentino for the delicate ruffles. Really thought-provoking thanks. Another great post. I recently bought the V 2185 as I really fancied those ruffles.